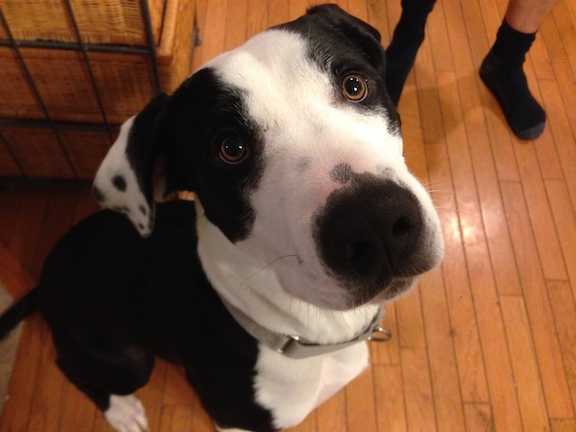 Banks is a one year old Great Dane / American Bulldog mix with a bad case of separation anxiety. I met his owner at my dog behavior workshop last weekend. She was confounded as aside from the separation Anxiety, he was a very well trained and behaved dog. When I met him in person I could immediately see what she meant. Banks had the most polite body language I have seen in a while. His ears were rounded, he made nice eye contact, carried himself confidently and put out a nice accommodating energy. He was a little excited at first, but took my correction very well; stopping him from jumping up without having to leave the area. We discussed a few things to help Banks with his separation anxiety and for the most part, is owners were on point. I suggested a few corrections to how they communicated with him, but he is such an intuitive and intelligent dog, they didn’t really need much help. Just a little fine tuning. Banks had strongly bonded with the families mother Yolanda. He would follow her around their home any time she got up or moved. When she was sitting, Banks was sitting or leaning against her and when Yoloanda was not home but other family members were, Banks leaned against them. This clinginess is absolutely related to the Separation Anxiety, so I showed Bank’s owners how to claim their personal space. It will be important for Banks to discover that he can be next to his owners without being in physical contact with them. Because he is so darn smart, it only took a few corrections before he understood and sat a foot away instead of on top of his owners. Next I showed them an exercise that will help Banks focus, look to them for guidance and give him the opportunity to restrain himself. The exercise requires the dog to ignore and keep a respectful distance form a high vale object lying in the middle of the floor. Dogs usually challenge a number of times before understanding that they cannot get the item. Not Banks. I only had to correct him once before he understood what I wanted. I coached his owners through the exercise to equal success and the more Banks practiced, the sharper his reactions. I suggested that they practice this exercise over the next week or two and gradually increase the amount of time Banks has to wait before giving him the command to get the treat. By gradually building up his ability to restrain himself, he will be able to better deal with being left alone. Because Banks had gone through a number of kennels, I introduced an exercise that asked Banks to stay inside the kennel, with the kennel door open. When a dog with Separation Anxiety is placed in a kennel and the door is closed, it often creates a panic in the dog. Under this stress, the dog looks at the kennel as something that is keeping it from reuniting with its owner. By leaving the door open, we can help the dog learn that staying inside the kennel on its own makes the owner happy. We practiced the dog staying in the kennel while Yolanda walked out of sight to start. He started to move to exit the kennel, but her husband made a sound to disagree. Banks immediately stopped and a moment later, lowered his head on the blanket. As soon as he did this I had Yolanda to come back into the room and sit down while ignoring the dog. By acting nonchalant about it, Banks will learn to relax and accept that when his owner is out of his sight, it doesn’t mean she isn’t coming back. The next step was having Yolanda go through the ritual she practices every time she leaves; putting on her shoes, putting on her jacket, grabbing her purse and picking up the car keys. We had put Banks into the kennel before she started and she ignored him completely. When she opened the door to the garage Banks whimpered once, but that was it. He didn’t even try to get up or leave the kennel despite the sound of the garage door opening, car starting, etc. These sounds were triggers that previously caused Banks to start to get anxious and excited. But now that the kennel wasn’t holding him back, he was able to remain calm. Yolanda returned a moment later as the point of the exercise was to introduce the expectation that he needed to stay calm and stay inside the kennel on his own. Moving forward, I suggested that they continue practice her leaving and gradually increase the length that she is gone. Starting out with a quick trip around the block then progressing to longer durations will help Banks practice being calm in short enough sessions where he can control himself. Because he was so quick to these new exercises and has such a desire to please, I’m guessing it won’t take longer than a week or two before Banks Separation Anxiety disappears completely.